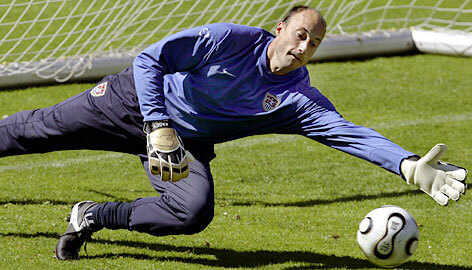 Yesterday afternoon Fulham completed the signing of American goalkeeper Kasey Keller. Keller was a free agent having most recently been playing for Borussia Mönchengladbach in the German Bundesliga. No contract term has been mentioned but I'm guessing at 37 it's a one year deal. Keller has made 364 appearances for English clubs including spells at Millwall, Leicester City and Tottenham Hotspur, and as well as his recent spell in Germany has also featured for Rayo Vallecano in the Spanish La Liga. I'm sure he can do a decent job for us and is a sensible addition to the squad the Villa game comes a little too soon for him so Tony Warner has a chance to make amends for his recent mistakes. Most importantly though we finally have a No. 1 back in our squad. Niemi's preference for 29 is all well and good but it made me all uncomfortable not having a number 1 on the team sheet. Keller looked awfully old and slow playing for the USA in the Gold Cup and Copa America this summer. He used to be an exceptional shot-stopper, but at even at his best that was his only skill. His distribution is terrible and if a Fulham defender ever plays a ball back to Keller's feet, expect the result to be laughable. That's a concern, I wonder how much football he's actually played in the last year. Even if he's not better than Warner he is better than putting Batista in. He's still way too young (and nervous) to risk. As a Yank and a goalie, I used to idolize Keller. This summer, however, it really looked like he'd finally lost a step. Let's hope he was just out of shape and a bit rusty, and that he's going to be a good signing. But I remain skeptical until he does something to erase the stink of his Copa America performance from my memory. I'm not saying he's not better than Warner, I'm just saying he's not very good anymore. ... and not much better than Warner? We'll have to see how it pans out. Looks like Warner's got the nod for Saturday, and after that maybe Niemi will return. I always liked Keller, right back from his Millwall days, so I hope it works out for him.